It seems like there are lots of interesting happenings today so let me just write some thing down for the record books. First of all, there’s the Australian annual horse racing event known as the Emirates Melbourne Cup. It’s even a public holiday in Melbourne. I had a small lunch in the office while watching the whole race with some bets going on just for social fun. My pick Septimus led the whole race up till the last 400m but could only finish 18th in the end, and it was even considered as one of the favorites! Reserve Bank of Australia (RBA) has slashed interest rates by 75 basis points to 5.25 per cent which exceeded the expected cut of 50 basis points. Economists say borrowers can look forward to more cuts in coming months. Today’s rate cut follows a 1 percentage point cut in October, and a 25 basis point cut in September. 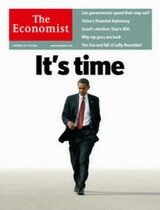 US Presidential elections begins and the polls are looking good for Barrack Obama. It will be interesting to see who the new US president will be for the next 4 years. The Economists posted yet another interesting front page cover for their November issue.